Thorny flowers, also described as prickly plants, plants, prickly flowers, spikes, thistles, and internally described as Needle Plants, are red plants that serve as obstacles in several Mario games. In Super Mario Galaxy and Super Mario Galaxy 2, prickly plants hurt Mario or Luigi when touched, and the only way to destroy them is by attacking them with a rubbery bulb, spinning a coconut into them, or having Yoshi eat them. There are three types: the standard variant, a larger variant, and a floating variant. The larger variants, after being destroyed by a coconut, will reveal a Sling Star or Launch Star leading to another planet. The floating variants serve as obstacles in various areas, and are more common in certain galaxies, like the Gusty Garden Galaxy, the Yoshi Star Galaxy, and the Tall Trunk Galaxy. When touched by the Co-Star Luma, prickly plants will retract their spikes, allowing Mario or Luigi to pass over them safely without needing to destroy them. Thistles later appear in Super Mario 3D Land, being first encountered in World 4-1. As of this game, their thorns are stubbier and are arranged in a globe, instead of being grown from the plant's calyx like in the previous games; their leaves also continuously rotate around their stems. They can be destroyed with a projectile (such as Fire Mario's or Luigi's fireballs), a tail whip in Tanooki form, by landing onto them in statue form or by touching them while invincible. In Mario Party: Island Tour, thorny flowers make an appearance in the minigame Goomba to Maneuver, scattered on the path that the player needs to follow. The player needs to maneuver a line of Goombas between them. Goombas that touch a thorny flower will be flung away, reducing the number of Goombas in the line. 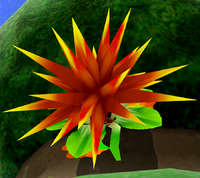 Thorny flowers appear in both normal and big sizes, with bigger ones becoming more common as the minigame progresses. In Mario Party: Star Rush, thorny flowers appear as obstacles in the minigame Leafboard Hoard. ↑ Black, Fletcher. Super Mario Galaxy PRIMA Official Game Guide, pages 43, 48, 50, 53, 170, 171, 175, 177, 178, 202, 207, 244, 303. ↑ Black, Fletcher. Super Mario Galaxy PRIMA Official Game Guide, page 302. ↑ Browne, Catherine. Super Mario Galaxy 2 PRIMA Official Game Guide, pages 112, 113, 114, 118. ↑ von Esmarch, Nick. Super Mario 3D Land PRIMA Official Game Guide. Page 187. ↑ Shogakukan. 2015. Super Mario Bros. Hyakka: Nintendo Kōshiki Guidebook, pages 136 and 170. This page was last edited on March 27, 2019, at 09:09.